"Sai Nath" redirects here. For the university, see Sai Nath University. Sai Baba of Shirdi, also known as Shirdi Sai Baba, was an Indian spiritual master who is regarded by his devotees as a saint, a fakir, a satguru and an incarnation (avatar) of Lord Shiva and Dattatreya. He is revered by both his Hindu and Muslim devotees during, as well as after his lifetime. Saibaba is now revered as incarnation of Sri Dattatreya and considered as Saguna Brahma. He is attributed to be the creator, sustainer and destroyer of this universe by his devotees. He is decorated with jewels and all forms of Hindu vedic deities as he is believed by his followers to be the supreme God. According to accounts from his life, he preached the importance of realization of the self and criticized love towards perishable things. His teachings concentrate on a moral code of love, forgiveness, helping others, charity, contentment, inner peace and devotion to the God and guru. He stressed the importance of surrender to the true Satguru, who, having trod the path to divine consciousness, will lead the disciple through the jungle of spiritual training. Sai Baba also condemned distinction based on religion or caste. It remains unclear if he was a Muslim or a Hindu. This, however, was of no consequence to Sai Baba. His teaching combined elements of Hinduism and Islam: he gave the Hindu name Dwarakamayi to the mosque in which he lived, practised both Hindu and Muslim rituals, taught using words and figures that drew from both traditions and took samadhi in Shirdi. One of his well-known epigrams, Allah Malik (God is King) and Sabka Malik Ek (Everyone's Master is One), is associated with both Hinduism and Islam. He is also known to have said Look to me, and I shall look to you. Sai Baba's date of birth including his birthplace remains unknown and is debatable due to lack of evidence and no definitive information exists to prove it. 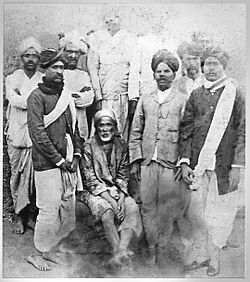 Most definitive information about Shirdi Sai Baba tends to be derived from a book called Shri Sai Satcharitra written by a disciple called Hemadpant (also known as Annasaheb Dabholkar / Govind Raghunath) in 1922 in Marathi. The book itself is a compilation based on accounts by his various disciples and Hemadpant's personal observations observing Sai Baba from 1910 onwards. Sai Baba's real name remains unknown. The name Sai was given to him by Mhalsapati when he arrived at Shirdi, a town now in the west Indian state of Maharashtra. The word Sai refers to a religious mendicant but can also mean God. In several Indian and Middle Eastern languages the term Baba is an honorific signifying grandfather, father, old man or sir. Thus Sai Baba denotes holy father, saintly father or (venerable) poor old man. Some of Sai Baba's disciples became famous as spiritual figures and saints, such as Mhalsapati, a priest of the Khandoba temple in Shirdi and Upasni Maharaj. He was revered by other saints as well, such as Saint Bidkar Maharaj, Saint Gagangiri_Maharaj, Saint Janakidas Maharaj and Sati Godavari Mataji. Sai Baba referred to several saints as 'my brothers', especially the disciples of Swami Samartha of Akkalkot. 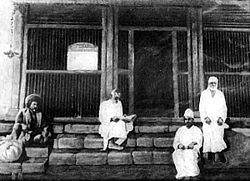 Shirdi Sai Baba (right) and some of his devotees at Dwarakamai, his own Temple. Although Sai Baba's origins are unknown, some indications exist that suggest that he was born not far from Shirdi. Historical researches into genealogies in Shirdi give support to the theory that Baba could have been born with the name Haribhau Bhusari. Baba was notorious for giving vague, misleading and contradictory replies to questions concerning his parentage and origins, brusquely stating the information was unimportant. He had reportedly stated to a close follower, Mahalsapati, that he has been born of Brahmin parents in the village of Pathri and had been entrusted into the care of a fakir in his infancy. On another occasion, Baba reportedly said that the fakir's wife had left him in the care of a Hindu guru, Venkusa of Selu and that he had stayed with Venkusa for 12 years as his disciple. This dichotomy has given rise to two major theories regarding Baba's background, with the majority of writers supporting the Hindu background over the Islamic, while others combine both the theories (that Sai Baba was first brought up by a fakir and then by a guru). His presence attracted the curiosity of the villagers and the religiously-inclined such as Mhalsapati, Appa Jogle and Kashinatha regularly visited him, while others such as the village children considered him mad and threw stones at him.After some time he left the village and it is unknown where he stayed at that time or what happened to him. However, there are some indications that he met with many saints and fakirs and worked as a weaver; he claimed to have fought with the army of Rani Lakshmibai of Jhansi during the Indian Rebellion of 1857. Sai Baba returned to Shirdi in 1858. He appeared at the Khandoba Mandir in Shirdi. The temple priest, Mahalsapati, upon seeing him for the very first time, welcomed him by saying 'Aao, Sai!' ('Come Sai'). From then on, He was known by the name (Sai Baba). Around this time he adopted his famous style of dressing, consisting of a knee-length one-piece Kafni robe and a cloth cap. Ramgir Bua, a devotee, testified that Sai Baba was dressed like an athlete and sported 'long hair flowing down to the end of his spine' when he arrived in Shirdi, and that he never had his head shaved. It was only after Baba forfeited a wrestling match with one Mohiddin Tamboli that he took up the kafni and cloth cap, articles of typical Sufi clothing. This attire contributed to Baba's identification as a Muslim fakir and was a reason for initial indifference and hostility against him in a predominantly Hindu village. For four to five years, Baba lived under a neem tree and often wandered for long periods in the jungle around Shirdi. His manner was said to be withdrawn and uncommunicative as he undertook long periods of meditation. He was eventually persuaded to take up residence in an old and dilapidated mosque and lived a solitary life there, surviving by begging for alms and receiving itinerant Hindu or Muslim visitors. In the mosque, he maintained a sacred fire which is referred to as a dhuni, from which he gave sacred ash ('Udi') to his guests before they left. The ash was believed to have healing and apotropaic powers. He performed the function of a local hakim and treated the sick by application of ashes. Sai Baba also delivered spiritual teachings to his visitors, recommending the reading of the Ramayan and Bhagavat Gita for Hindus and Qur'an for Muslims. He insisted on the indispensability of the unbroken remembrance of God's name (dhikr, and often expressed himself in a cryptic manner with the use of parables, symbols and allegories). Baba is believed to have grown and cultivated a garden called Lendi Baug, named after a riverlet called Lendi which flowed nearby. The garden continues to be a place visited by pilgrims, and has temples, samadhis of people and animals associated with Shirdi Sai Baba's life and temples. In 1910, Sai Baba's fame began to spread in Mumbai. Numerous people started visiting him, because they regarded him as a saint with the power of performing miracles or even as an avatar. They built his first temple at Bhivpuri, Karjat. In August 1918, Shirdi Sai Baba told some of his devotees that he would soon be "leaving his mortal body" (dying). Towards the end of September, he had high fever and stopped eating. As his condition deteriorated, he asked his disciples to recite holy texts to him and continued to meet visitors. On 15th October 1918, he breathed his last. The day coincided with the Hindu calendar date that year for Vijayadashami. As is the case with Hindu saints, his followers believed that Sai Baba had accepted the state of samadhi and attained nirvana. His remains were buried at Buti Wada in Shirdi, and it became a became a place of worship, today known as Shree Samadhi Mandir or Shirdi Sai Baba Temple. Sai Baba opposed all persecution based on religion or caste. He was an opponent of religious orthodoxy — Christian, Hindu and Muslim. Sai Baba encouraged his devotees to pray, chant God's name, and read holy scriptures. He told Muslims to study the Qur'an and Hindus to study texts such as the Ramayana, Bhagavad Gita and Yoga Vasistha. He was impressed by the philosophy of the Bhagavad Gita and encouraged people to follow it in their own lives. He advised his devotees and followers to lead a moral life, help others, love every living being without any discrimination, and develop two important features of character: devotion (Shraddha) and patience (Saburi). He criticised atheism. In his teachings, Sai Baba emphasised the importance of performing one's duties without attachment to earthly matters and of being content regardless of the situation. In his personal practice, Sai Baba observed worship procedures belonging to Islam; he shunned any kind of regular rituals but allowed the practice of Salah, chanting of Al-Fatiha, and Qur'an readings at Muslim festival times. Occasionally reciting the Al-Fatiha, Baba enjoyed listening to mawlid and qawwali accompanied with the tabla and sarangi twice daily. Unless there is some relationship or connection, nobody goes anywhere. If any men or creatures come to you, do not discourteously drive them away, but receive them well and treat them with due respect. Sri Hari (God) will certainly be pleased if you give water to the thirsty, bread to the hungry, clothes to the naked, and your verandah to strangers for sitting and resting. If anybody wants any money from you and you are not inclined to give, do not give, but do not bark at him like a dog." The Shirdi Sai Baba movement began in the 19th century, while he was living in Shirdi. A local Khandoba priest, Mhalsapati Nagre, is believed to have been his first devotee. In the 19th century, Sai Baba's followers were only a small group of inhabitants of Shirdi and a few people from other parts of India. Today, the Sai Baba Temple in Shirdi is visited by an average of 25,000 pilgrims a day and during religious festivals, this number can reach up to 100,000. The Sai Baba temple in Shirdi is managed by the Shri Sai Baba Sansthan Trust. Inside the temple, the statue of Sai Baba and the Samadhi are carved out of Italian marble and is seen draped with royal cloth, wearing a gold crown and adorned with fresh flower garlands. The interior is made of old stone bricks. The interior, as well as the exterior (cone) of the temple, is covered with gold. As per rituals and traditions dating back to when Baba was still alive, four Aarti's are held daily (corresponding to the time of the day) inside the Samadhi Mandir. The Palanquin procession of Sai Baba takes place every Thursday from the Samadhi Mandir to Dwarkamayi, onward to Chavdi and back to the Sai Baba Mandir. Devotees belonging to all faiths are welcome to take Darshan in the Samadhi Mandir and have free meals in the Prasadalaya, irrespective of caste, creed, and religion as these were one of the ideal principles of Sai Baba. Sai Baba of Shirdi is especially revered and worshiped in the states of Maharashtra, Odisha, Andhra Pradesh, Telangana, Karnataka, Tamil Nadu and Gujarat. In August 2012, an unidentified devotee, for the first time, donated two expensive diamonds valuing ₹11.8 million at the Shirdi temple, as revealed by Saibaba trust officials. In recent years, the Shirdi Sai movement has spread to the Caribbean and to countries such as the Nepal, Canada, United States, Australia, United Arab Emirates, Malaysia, United Kingdom, Germany, France and Singapore. A marble statue of Sai Baba. "In essence or basic principle, there is no difference whatever between Hindu and Muslim. You took birth in human body to point out this. You look with affection on both Hindus and Muslims. This, Sai, who pervades all, as the soul of all, shows." Baba would often talk about the Hindu gods, quoting from sacred texts or even commenting upon passages of the Bhagavadgita, the Isha Upanishad, and so forth. The names of Krishna and Rama seem to have been particularly dear to him. With his Muslim followers, Baba would always talk of Allah and the Koran, often quoting Persian verses. One of his favorite expressions was "Allah rakhega vaiia rahena", that is, "Let us be content with what we have, and submit our will to Allah." On several occasions, Sai reassured his listeners by saying that he, like them, was but a devotee of Allah, a humble faqir with two arms and two legs. In later years, Parsis and even a few Christians would come to Shirdi. Sai Baba respected all creeds, true to his conviction that all religions are but particular paths leading to one ineffable goal. His notion of the unity of all mankind that appealed to everyone was very congruous with Sufism of Islam. "God being one and the master of all also meant that all his creatures were part of one big family," writes Sikand. "This belief was entirely in keeping with ... the teachings of Sufis, who believed that the light of God exists in every creature, indeed in every particle of His creation." Sai Baba urged his Hindu followers to read their holy books and find their own path. For him, all paths were equally valid, "Ishwar" (the Hindu God) and "Allah" being synonymous. People coming to his abode were so taken aback to see Hindus, Muslims, and others living together so peacefully that in many instances it changed their entire lives and belief systems. According to his followers, he appeared to them in their dreams and gave them advice. His devotees have documented many stories. In recent times, there are many claims of Sai Baba's Mediumship or his channel like spiritual novelist Ruzbeh Bharucha  and receiving Sai Baba's divine guidance as claimed by Shivkrupanand Swami. Sai Baba left behind no spiritual heirs, appointed no disciples, and did not provide formal initiation (diksha), despite requests. Some disciples of Sai Baba achieved fame as spiritual figures, such as Upasni Maharaj of Sakori. After the demise of Sai Baba, his devotees offered the daily Aarti to Upasni Maharaj when he paid a visit to Shirdi twice within 10 years. During Sai Baba's lifetime, the Hindu saint Anandanath of Yewala declared Sai Baba to be a "spiritual diamond." Another saint, Gangagir, also called him a "jewel." Sri Beedkar Maharaj greatly revered Sai Baba and in 1873, when he met him he bestowed the title Jagad guru upon him. Sai Baba was also greatly respected by Vasudevananda Saraswati (known as Tembye Swami). He was also revered by a group of Shaivic yogis, known as the Nath-Panchayat. He is considered an avatar of the Supreme Reality (Brahman or God), a satguru, or saint, depending on individual proclivities. This is not uncommon in Hinduism where there is no central doctrine or cosmology, but a basis in individual faith and spirituality. Saibaba was revered by prominent Zoroastrians such as Nanabhoy Palkhivala, Farhaad Panthaky and Homi Bhabha, and has been cited as the Zoroastrians' most popular non-Zoroastrian religious figure. Meher Baba, who was born into a Zoroastrian family, met Sai Baba once, during World War I, in December 1915. This event is considered as the most significant in Meher Baba's life. Shri Sai Satcharita (Sai Baba's life story), makes no mention of Meher Baba but Lord Meher, the life story of Meher Baba, there are numerous references to Sai Baba. Meher Baba, who claimed he was an (the) Avatar, credited his Avataric advent to Upasni, Sai Baba, and three other Perfect Masters: Hazrat Babajan, Hazrat Tajuddin Baba, and Narayan Maharaj. He declared Sai Baba to be a Qutub-e-Irshad (the highest of the five Qutubs, a "Master of the Universe" in the spiritual hierarchy). This classification of avatar and satgurus and the associated name is applied within the Meher Baba community alone. Shri Sai tends to be a very common name for establishments in Mumbai in particular and Maharashtra in general. It tends to be popular for a variety of establishments including restaurants, real estate agencies and hotels. There are many temples of Sai Baba in India. Temples are also located in countries outside India, including the United States, Trinidad and Tobago, Guyana, Suriname, Fiji, Mauritius, South Africa, Netherlands, Kenya, Benin, Cuba, Canada, Pakistan, Australia, United Kingdom, Germany, Japan and New Zealand. Present in the mosque in Shirdi in which Sai Baba lived, is a life-size portrait of him by Shama Rao Jaykar, an artist from Mumbai. Numerous monuments and statues depicting Sai Baba which serve a religious function have been made. One of them, made of marble by a sculptor named Balaji Vasant Talim, is in the Samadhi Mandir in Shirdi where Sai Baba was buried. In 2008, India Post has issued a commemorative postage stamp of ₹5.00 to honour Sai Baba. 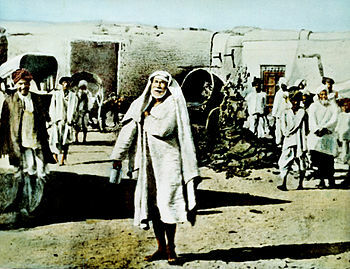 Sai Baba has been the subject of several feature films in many languages produced by India's film industry. 1986 Sri Shirdi Saibaba Mahathyam Vijayachander K. Vasu Telugu Dubbed into Hindi as Shirdi Sai Baba Ki Kahani, into Tamil as Sri Shiridi Saibaba. Also featuring Chandra Mohan, Suthi Veerabhadra Rao, Sarath Babu, J.V. Somayajulu, Rama Prabha, Anjali Devi, Raja. 1989 Bhagavan Shri Sai Baba Sai Prakash Sai Prakash Kannada Also starring Ramkumar, Brahmavar, Vijaylakshmi. 2005 Ishwarya Avatar Sai Baba Mukul Nag Ramanand Sagar Hindi Composite movie drawn from Sagar's Sai Baba (TV series). 2010 Malik Ek Jackie Shroff Deepak Balraj Vij Hindi Also featuring Manoj Kumar, Divya Dutta, Rohini Hattangadi, Zarina Wahab and Anup Jalota as Das Ganu. Harsh Agarwal Hindi Currently airing on Sony Entertainment Television Asia-India since September 2017. ^ "Shirdi Sai Baba's 97th death anniversary: The one who was revered by all". India Today. 15 October 2015. Archived from the original on 31 May 2017. Retrieved 19 November 2017. ^ "Life of Shirdi Saibaba – Life Story of Saibaba of Shirdi – Shirdi Sai Baba Biography". www.shirdi.org.uk. Archived from the original on 7 May 2017. Retrieved 20 March 2017. ^ "Shri Sai Satcharitra in English – Publications". shrisaibabasansthan.org.in. Archived from the original on 19 March 2017. Retrieved 20 March 2017. ^ a b Rigopoulos, Antonio (1993). The Life and Teachings of Sai Baba of Shirdi. SUNY. p. 3. ISBN 0-7914-1268-7. ^ a b D. Hoiberg; I. Ramchandani (2000). Students' Britannica India. Popular Prakashan. p. 324. Archived from the original on 3 March 2018. ^ "Chronology of evenets – Shirdi Sai Baba". www.saibaba.ws. Saibaba WS. Retrieved 17 July 2018. ^ Shri Sai Satcharitra – online version. Retrieved 17 July 2018. ^ A dictionary of Urdu, classical Hindi, and English. Dsalsrv02.uchicago.edu. Retrieved on 2017-06-24. ^ Kamath, M.V. ; Kher, V.B. (1997). Sai Baba of Shirdi: A Unique Saint. India: Jaico Publishing House. pp. 13–18. ISBN 81-7224-030-9. ^ Rigopoulos, Antonio (1993). The Life and Teachings of Sai Baba of Shirdi. SUNY. p. 8. ISBN 0791412687. ^ Narasimhaswami, B.V. (1986). Sri Sai Baba's Charters & Sayings. All-India Sai Samaj, Madras. p. 62. ^ Rigopoulos, Antonio (1993). The Life and Teachings of Sai Baba of Shirdi. SUNY. p. 45. ISBN 0791412687. ^ Rigopoulos, Antonio (1993). The Life and Teachings of Sai Baba of Shirdi. SUNY. p. 46. ISBN 0791412687. ^ Parthasarathy, Rangaswami (1997). God Who Walked On Earth: The Life and Times of Shirdi Sai Baba. Sterling Publishing. p. 15. ISBN 81-207-1809-7. ^ (To Balakrishna Upasani Shastri) "I was at the battle in which the Rani of Jhansi took part. I was then in the army." Quoted in Narasimhaswami, B.V. (1986). Sri Sai Baba's Charters & Sayings. All-India Sai Samaj, Madras. p. 209. ^ Warren, Marianne (1997). Unravelling the Enigma: Shirdi Sai Baba in the Light of Sufism. Sterling Publishers. p. 104. ISBN 81-207-2147-0. ^ Rigopoulos, Antonio. The Life and Teachings of Sai Baba of Shirdi. ISBN 0-7914-1268-7. ^ Warren, Marianne (1997). Unravelling the Enigma: Shirdi Sai Baba in the Light of Sufism. Sterling Publishers. p. 45. ISBN 81-207-2147-0. ^ Rigopoulos, Antonio (1993). The Life and Teachings of Sai Baba of Shirdi. SUNY. p. 86. ISBN 0-7914-1268-7. ^ "Lendi baug". www.shirdisaitemple.com. Shirdi Sai Baba Temple (official website). Retrieved 17 July 2018. ^ Chitluri, Vinny (2011). Baba's Gurukul: SHIRDI. Sterling Publishers Pvt. Ltd. p. 176. ISBN 9788120790186. ^ Nanda, A. R. (8 April 2011). The Eternal Sai Phenomenon. Sterling Publishers Pvt. Ltd. ISBN 9788120790247. Archived from the original on 3 March 2018. ^ a b "Worship & Devotes". www.shreeomsainath.com. Archived from the original on 3 March 2018. Retrieved 13 March 2017. ^ Warren, Marianne (1997). Unravelling the Enigma: Shirdi Sai Baba in the Light of Sufism. Sterling Publishers. pp. 340–341. ISBN 81-207-2147-0. ^ "About us – Chronology of events". www.sai.org.in. Shri Sai Baba Trust (Official website). Retrieved 17 July 2018. ^ Dabholkar, Hemandpant (12 April 2016). Shri Sai Satcharitra: The Wonderful Life and Teachings of Shirdi Sai Baba. Enlightenment press. ISBN 0692690832. ^ Rigopoulos, Antonio (1993). The Life and Teachings of Sai Baba of Shirdi. SUNY. p. 139. ISBN 0-7914-1268-7. ^ Dabholkar/Gunaji Shri Sai Satcharita/Shri Sai Satcharitra chapter 27. ^ "Shri Sai Satcharitra". Saibaba.org. Archived from the original on 16 October 2012. Retrieved 17 June 2013. ^ Warren, Marianne (1999). Unravelling The Enigma: Shirdi Sai Baba in the Light of Sufism. Sterling Publishers. p. 29. ISBN 0-7914-1268-7. ^ Warren, Marianne (1999). Unravelling The Enigma: Shirdi Sai Baba in the Light of Sufism. Sterling Publishers. p. 30. ISBN 0-7914-1268-7. ^ Rigopoulos, Antonio (1993). The Life and Teachings of Sai Baba of Shirdi. SUNY. pp. 261–352. ISBN 0-7914-1268-7. ^ Dabholkar (alias Hemadpant) Shri Sai Satcharita Shri Sai Baba Sansthan Shirdi, (translated from Marathi into English by Nagesh V. Gunaji in 1944) available online Archived 12 May 2006 at the Wayback Machine or downloadable Archived 14 April 2006 at the Wayback Machine or on Kindle. ^ Rigopoulos, Antonio (1993). The Life and Teachings of Sai Baba of Shirdi. SUNY. p. 3. ISBN 0-7914-1268-7. ^ "Holy Shirdi |Mhalsapati's House". holyshirdi.saibaba.com. Archived from the original on 20 July 2017. Retrieved 13 March 2017. ^ "Shirdi Sai Baba Foundation". www.ssbf.co.in. Archived from the original on 2014-09-27. Retrieved 2017-03-13. ^ Mhatre, Shridhar. "Amazing Maharashtra: SHIRDI SAIBABA TEMPLE". Amazing Maharashtra. Archived from the original on 14 April 2017. Retrieved 13 March 2017. ^ "Top 30 Famous Temples in India: Tour My India". Tour My India. 4 December 2013. Archived from the original on 14 March 2017. Retrieved 13 March 2017. ^ "Unknown person donates diamonds worth Rs 1.18 crore (approximately $240,000) at Shirdi". Indian Express. 1 August 2012. ^ Shridi Sai Baba Archived 16 January 2017 at the Wayback Machine. Ram Mandir Leicester. Retrieved on 2017-06-24. ^ Shri Shirdi Saibaba Temple Association of London Archived 4 January 2017 at the Wayback Machine. Shirdisai.org.uk. Retrieved on 2017-06-24. ^ Rigopoulos, Antonio (1993). The Life And Teachings Of Sai Baba Of Shirdi. SUNY Press. p. 70,71. Archived from the original on 14 September 2017. ^ Pal, Amitabh (2011). "Islam" Means Peace: Understanding the Muslim Principle of Nonviolence Today. ABC Clio. p. 71. Archived from the original on 14 September 2017. ^ Mukund Raj (1 November 2010). "Shri Sai Baba Shirdi Home Page". Saibaba.org. Archived from the original on 30 December 2010. Retrieved 8 January 2011. ^ Sonal Srivastava. "Channelling Sai Baba". ^ Shivkrupanand Swami. "Samarpan Yog of the Himalayas: Autobiography of a Realised Sage, a Spiritual Journey, Volume 3". ^ a b sandman (20 January 2009). "Who is Sai Baba' guru? Zarzari Zar Baksh who lived at Khuldabad, says Meher Baba". Asian Tribune. Archived from the original on 19 November 2010. Retrieved 8 January 2011. ^ a b "Who is Shirdi Sai Baba". Archived from the original on 15 October 2007. Retrieved 29 October 2007. ^ "A Short Biography of Shree Sadguru Beedkar Maharaj". Archived from the original on 13 October 2007. Retrieved 29 October 2007. ^ "Beedkar Maharaj". Sai Vichaar, Oct 06, 2005, volume 8, issue 2001. Archived from the original on 17 October 2007. Retrieved 29 October 2007. ^ Hinnells, John R. (2005). The Zoroastrian Diaspora:Religion and Migration: Religion and Migration. OUP Oxford. p. 109. ISBN 978-0-19-826759-1. Archived from the original on 3 March 2018. ^ "Directory of Shri Shirdi Saibaba temples around the world". Omsrisai.net. Archived from the original on 22 February 2013. Retrieved 17 June 2013. ^ "Shri Shirdi Sai Baba Stamp". www.istampgallery.com. Archived from the original on 13 April 2017. Retrieved 13 April 2017. ^ "Postage Stamps". postagestamps.gov.in. Archived from the original on 10 April 2017. Retrieved 13 April 2017. ^ "Official Page of Bhagwan Sri Shirdi Sai Baba on Facebook". Archived from the original on 3 March 2018. ^ "SET India – Indian Television, Hindi Serials, TV Shows & Live Reality Soaps| Entertainment Channel". www.setindia.com. Archived from the original on 1 December 2017. Retrieved 23 November 2017. Parthasarathy, Rangaswami, God Who Walked on Earth. The Life and Times of Shirdi Sai Baba, New Delhi, Sterling, 1996. ISBN 81-207-1809-7. Rao, Sham P. P., Five Contemporary Gurus in the Shirdi (Sai Baba) Tradition, Bangalore: Christian Institute for the Study of Religion and Society, 1972. LCCN 75-905429. White Charles S. J., The Sai Baba Movement: Study of a Unique Contemporary Moral and Spiritual Movement, New Delhi, Arnold-Heinemann, 1985. Walshe-Ryan, Lorraine, I am always with you, Reprint 2008, New Delhi, Sterling Publishing, 2006. ISBN 978-81-207-3192-9. 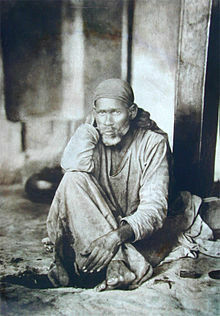 Wikimedia Commons has media related to Sai Baba of Shirdi.